Alan Bradley wove another enjoyable and intriguing tale starring Flavia de Luce, the darker, British version of Harriet the Spy. I had already fallen hard for Flavia when reading The Sweetness at the Bottom of the Pie and The Weed that Strings the Hangman’s Bag — books one and two in the Buckshaw Chronicles. In the third installment of this bestselling, award-winning, sister-poisoning, bicycle-riding, murder-investigating, and utterly captivating series, Flavia de Luce must draw upon Gypsy lore and her encyclopaedic knowledge of poisons to prevent a grave miscarriage of justice. “You frighten me,” the old Gypsy woman says. “Never have I seen my crystal ball so filled with darkness.” So begins eleven-year-old Flavia de Luce’s third adventure through the charming but deceptively dark byways of the village of Bishop’s Lacey. The Gypsy’s vision opens up old wounds for our precocious yet haunted heroine, and sets her mind racing in search of what it could mean. When Flavia later goes to visit the Gypsy at her encampment, she certainly doesn’t expect to find the poor old woman lying near death in her caravan, bludgeoned in the wee hours. Was it an act of retribution by those who thought that the woman had abducted a local child years before? But how can she prove this crime is connected to the missing baby? Did it have something to do with the weird sect who met at the river to practice their secret rites? While still pondering the possibilities, Flavia stumbles upon a corpse—that of a notorious layabout and bully she had only recently caught prowling about Buckshaw. The body hangs from a statue of Poseidon in Flavia’s very own backyard, and our unflappable sleuth knows it’s up to her to figure out the significance. Pedalling her faithful bicycle, Gladys, across the countryside in search of clues to both crimes, Flavia uncovers secrets both long-buried and freshly stowed—the dodgy dealings of a local ironworks, the truth behind the Hobblers’ secret meetings, her own ancestor’s ambitious plans—all the while exhausting the patience of Inspector Hewitt. But it’s not long before the evidence starts falling into place, and Flavia must take drastic action to prevent another violent attack. 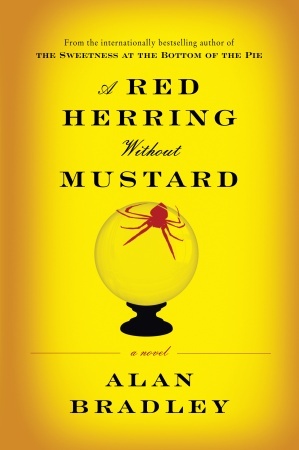 Alan Bradley and Flavia do not disappoint readers and fans alike in A Red Herring Without Mustard. The book is written in first person and I certainly enjoy Flavia’s inner monologue and humour—such as referring to the town librarian as a “freelance holy terror” since retirement. For an 11-year-old child, Flavia is incredible intelligent, self-sufficient and confident, having no trouble trekking all over the local countryside. I really enjoy Flavia’s priorities and zeal — nothing is impossible. There is a perfect balance of amateur sleuth, genius chemist, and bratty little sister. In each book we catch a small glimpse of regular life at Buckshaw, sometimes things that wouldn’t particularly affect a child. I doubt that at age 11 I had any idea of my parents’ financial situation, and Flavia’s father is often trouble by such grown-up matters. Flavia manages to shrug these worries off with youthful innocence when the next dead body or clue turns up. While this is realistic, I do hope the next installment reveals more about the story at home; something about A Red Herring Without Mustard left me unfulfilled despite being incredibly entertained.